I don't often review albums on this here site that are too far removed from the VG Inspired Music culture. Though there have been times in the past I have deviated from such rules (even my first review), but I don't stretch those rules often. There are certainly times to make exceptions for these rules though. 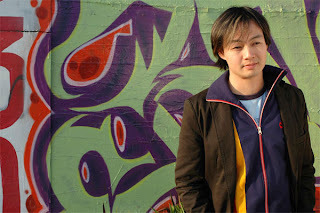 Christopher Tin is an artist for which I am glad to make such an exception. I heard of him for the first time several years ago on a trip to the 2005 Video Games Live at the Hollywood Bowl. I was lucky enough to chat with him and found him approachable, humble, but also quite excited. The reason Tin was at VGL was because his title theme to acclaimed PC title Civilization IV would be performed live for the first time. This was quite the accomplishment as Civilization is Christopher Tin's first time working on a game soundtrack. After meeting Tin before the VGL performance, I made a note to pay attention to his song Baba Yetu when it came up in the program later that night (having never played Civilization IV this would be my first time hearing his work). Little did I know it wouldn't take much to get my attention as the song was phenomenal and quite unlike a lot of contemporary VGM during that time or since. The song was a culturally rich affair of orchestration alongside Swahili lyrics. The two in tandem created an impactful and refreshing change of pace from the mostly instrumental fair of other video game songs. Flash forward a few years and we see that Christopher Tin is still working hard on creating great compositions, and has been kind of enough to grace me with a review copy of his debut album Calling All Dawns (which you can listen to and purchase at christophertin.com). The album is twelve globe spanning tracks of Orchestral refinement and worldly flavors. We lead off with the forementioned and amazing Baba Yetu (feat. Soweto Gospel Choir). The song and lyrics translate from Swahili to mean Our Father and is a moving rendition of The Lord's Prayer. Starting with a somber opening, we quickly hear a strong voice and rhythmic percussion, which then opens up to a full choir of sound. The song travels strong rises and lulls in sound to create an atmospheric idea of running over hills and valleys. Baba Yetu's orchestral fills come in about midway to create an ever stronger and more epic presence. Soft rises and an inviting end create a welcoming tone to the album, and fits very well to start the "day" portion of Calling All Dawns. Mado Kara Mieru (feat. Lia, Aoi Tada, Kaori Omura) continues a trend of soft awakening with the short acapella to introduce the song. Through The Window I See is the english translation of the song, which is adapted from a Japanese haiku by Hattori Ransetsu, Yamaguchi Sodo, Kaga no Chiyo, & Masaoka Shiki. The song takes us on a year long look at life as observed through what one imagines as the large front window of a home. Spanning spring to winter and back into spring, Mado Kara Mieru looks at the transition of life over this span. Both the singing and music follow a fragile path, but as we reach into Autum the orchestral backing helps build the song into an ever growing urgency until we reach a sobering high point in the following line, "yomei/ ikubaku ka aru/ koyoi hakanashi/ inochi mijikashi" or "my remaining days/ how much more is there to live?/ the night is brief/ life is short." From the rising Autum we come into the distant winter, which changes the song up to a male voice, which spirals up to the sharpest build yet in the song to drop us back into the fragility of Spring, and shows us the cyclical nature of life with it's many ups and downs. This is a good place to mention the brilliant way Christopher Tin set his album to gently and seamlessly lead one song into the other, for since I have been reviewing this album I have several times not even noticed the point where the song prior lead into Dao Zai Fan Ye (feat. Jia Ruhan). From the Dao DeJing and Mandarin for The Path is Returning. The song opens with strings that would automatically conjure up Kow Otani and Shadow of The Colossus on first listen. The lyrics flow in seamlessly and create an austere mood. As if you can look on at the song from a distance, but not draw too close. The chorus of voices seem to lead the instruments through a narrow path as small flourishes of sound float away. The final pieces of music gently saunter off and before we know it we have moved onwards. Now we arrive at possibly my favorite song of the album, Se É Pra Vir Que Venha (feat. Dulce Pontes), an uplifting Portuguese track based on the poetry of Patricia Magalhães. Whatever Comes, Let It Come as it might be entitled in english draws you in with gentle strings and distant voices. This lifts and falls into a cozy piano alongside the enchanting vocals of Dulce Pontes. Piano gives way to percussion and strings, and the singing becomes ever more fervent and strong. About two and a half minutes in we drop down and are once again met by soft vocals alongside comforting piano, but as if riding the tone of Pontes voice, drums crash in as her singing rises, and strings as she comes back down. The most emotion is felt in the last line of "Se é pra vir, que venha" or "Whatever comes, let it come" as her voice peters out delicately. Without a pause we are already well into our next song. The French Rassemblons-Nous, or Let Us Gather starts off with some electronic reverberations which are able to make themselves at home alongside the so far very organic and orchestral feel of the album so far. This sound fades off into strong singing alongside equally powerful strings and a simple but catchy percussive track. A lo-fi refrain of voices announce the chorus, and bring back the synthesized feelings from the songs introduction. This moment is fleeting though as we swiftly reenter the verse of the song. Well into that verse we are met with an intertwining of the male and female voices which give way to an ever rising chorus to drive home the idea of the collective strength and goals of humanity. We reach a fevered pitch and at the highest point the voices drop off and we are lulled back down amidst fading horns. A haunting refrain starts off the Latin sung Lux Aeterna, otherwise known as Eternal Light from the Requiem Mass. With a simple series of strings and notes, the mostly instrumental piece slowly leads into the Night portion of the album. What feels like very quickly our journey continues into Caoineadh (feat. Anonymous 4). Irish for To Cry, and from the Caoineadh Airt Uí Laoghaire, by Eibhlín Dubh Ní Chonaill. The chorus rises and continues on with a lonely unifying tone as we traverse through the somber Irish countryside and learn the story of one brave and noble person. The song closes on the same serious tone it has held since the opening, but along with the final lines we have an unfinished but upbeat end to the song. Hymn Do Trojcy Swietej (feat. Frederica von Stade) is the final song of the Night. Hymn to The Holy Trinity is a Polish Catholic Hymn, which is of course performed in it's native Polish. As with the other two Night tracks, we set off with a soft, almost dream like state. Hearing soft strings which slide along until we reach the distant sounding vocals which glide ever closer and produce an earnest but sanctified feeling throughout the track. As we reach the last length of the song, we are met with not just a solo voice, but a chorus of voices rising up from what seems like the same distant place from the songs opening, but the voices grow warmer and closer, as if you are slowly finding your way towards them from a thickened fog. When you finally do come face to face with the voices you have been searching for, the song slowly fades out into a misty ending as the night gives way to a slowly brightening sky. The black night turns to a graying dawn with the song Hayom Kadosh. A Hebrew song from the Book of Nehemiah, which in English means Today is Sacred. The shortest song on the album, clocking in at under two minutes. Much is squeezed in that narrow time though, starting with a rising of voices as if they are riding on the rays of the sun itself. We swiftly move through this evocative beginning to a new day, which leads right into Hamsafar (feat. Sussan Deyhim) seamlessly. Farsi is the tongue of this track, which translates to Journey Together and is from the Rubaiyat of Omar Khayyam. I consider this a stand out title track on the same level as the opening Baba Yetu, and is able to evoke many of the same emotions and thoughts throughout. Opening strongly and just as the song finds it's opening we come to a halt. Not for long though, as we are off again this time with the worldly and inviting singing of Sussan Deyhim. An upbeat backing chorus carries us along as the song leads us through an ever brightening dawn that opened in the previous track. As each line continues onward we are met with ever more rays of light breaking through the clouded formerly night sky and rising to an abrupt end. Another seamless movement leads us right into Sukla-Krsne or Light and Darkness. A Sanskrit song from the Bhagavad Gita. Another short song reaching just over the two minute mark. The sanskrit makes a very interesting song lyrically. The quick pace of the singing with the sometimes sparse music create a very interesting juxtaposition in tones. The song starts off playfully enough but becomes ever strengthened and meaningful as the many voices tell the tale of what it means to be a Yogi and the play of light and darkness. A lyrically intriguing piece which paints the sky with light, and seems to consider the thought and necessity of the cold night in a journey towards renewal and rebirth. The song continues to build up this cacophony of dual ideas which builds to a head and creates possibly the best ending to any song on this collection. With the end of this song it feels as if the final lingering shadows of the night have vanished. That leads us into what feels like an inspiring reprise in Kia Hora Te Marino. Maori for May Peace Be Widespread, a traditional Maori blessing. The song continues the mood created in Baba Yetu and Hamsafar with the upbeat vocals and worldly traveling like atmosphere of the song. The song also brings together the overarching theme of peace that has pervaded and been weaved throughout the entire album. The ending of the song leads to a powerful build of music and voice. This creates a feeling as if flying over huge sections of the earth and rising up into the very orbit of the planet. With the final refrain of sound showing the earth in it's small place in the solar system and driving home the final line of the album "Gather, gather and go forward!" That brings the album to a close. Though you may want to have this album on repeat, since just like the album flows from song to song, and from day to night to dawn, the album cycles again into day from the close to the reopening of the track Baba Yetu to incredible effect. If you are anything like me this flowing nature will lead to much repeated listening. Calling All Dawns is a collection of songs that has to be heard because many different ideas and opinions can be taken away from this work. That may be one of the signs of a creation that is truly compelling and sustaining though. Repeated listens and reads with the liner notes are a must, as new things are gleamed and understood with each new listen. This was also a very complicated album to review. At times I wondered if I was even qualified to assess this album. with it's complexity in both music and meaning I felt like one would need to have a grand working knowledge of the technical work at play in music. I came to terms with that shortcoming by simply trying to show the meaning I garnered from it and the ideas it seemed to evoke in my own mind. 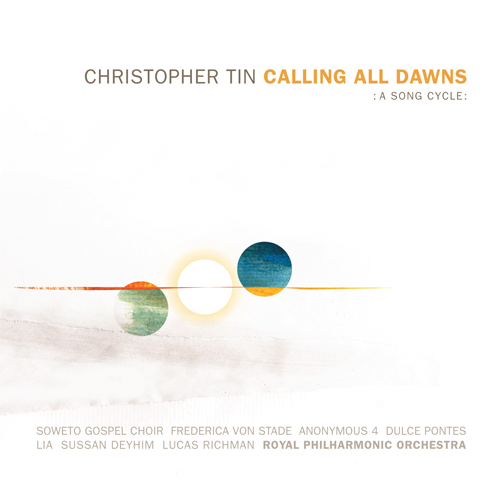 Christopher Tin said himself, "The message of the album is that we are interconnected as a people; and despite our differences in culture, religion and belief, we all share the same common human experiences." and as I listened I thought over that idea he put into these songs, and found myself finding this shared bond through the repeated musical moods and imagery the music created, alongside the lyrics which were able to stand out distinctly yet show a cohesive whole between so many cultures and texts. Through the twelve languages that traverse the album we gather a sense of seriousness contemplation, but among the brush of reverence we see that there remains growing seeds of hope, playfulness, wishful thoughts that are necessary to an increasingly global culture. I feel that sometimes I take out from music more than has been put into the effort of creating it, but this album creates so many moods and thoughts that it would seem quite counter to the energy put into this album to not gleam as much thought as possible from this. The energy put into this album is also quite significant, as the liner notes say "Calling All Dawns features over 200 musicians from 5 continents, including the Royal Philharmonic Orchestra, 4 choirs, 17 soloists, percussion ensembles, ethnic instrumentalists, and a team of Maori men performing a haka." So your average home recording musician this is not. I strongly urge you to go to the Calling All Dawns album page at christophertin.com where you can listen to lengthy samples of all the songs on the album to get a great feel for yourself. Of course I would also strongly urge a purchase as well! I will end this article with a video of Baba Yetu I was lucky enough to see myself earlier this year when I saw it performed by the Golden State Pops Orchestra and conducted by Christopher Tin himself.